A biochemist’s perspective of plastic rice, synthetic eggs etc. 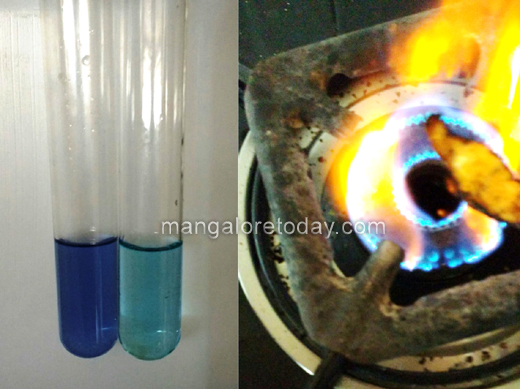 Mangaluru, June 10, 2017: Having qualified as a medical biochemsit in 1976 and in practice as one ever since the recent controversy about ’plastic rice and sugar, synthetic eggs hit me hard and started me thinking about the reasons that may be behind and here is my perspective as a man of science, a teacher, biochemist and a consumer activist. One can also bring in the perspective of scientifc temper too as it is the lack of it that is causing the people to believe in such fantastic lies. Here is the press note. needless to add I am perfectly willing to share the details about preparations of the reagents which can be done at any higher primary school level by science teachers or any well informed persons. The recent publicity for plastic rice, plastic sugar, synthetic egg etc. made me ponder about why these rumours are being circulated. After a lot of analysis of these and a few experiments later the truth flashed upon me- it is the organic, yoga lobby! If you may wonder why it is so. Just take a look at the economics- good quality rice sells at around 40 per kg , the rates for plastic are not less than 120 per kg and add to that the labour, wastage and all the factors that go into manufacturing and one will wonder as to why any one would try to make profits by making ‘plastic rice’! The same with sugar. With sugar retailing at around the same price as rice why should any one try to make synthetic sugar and make a windfall out of it? Coming to ‘synthetic eggs’ with the natural eggs selling at Rs.5 each how can any one be expected to make huge profits from manufacturing them from unspecified raw materials by an apparently very labor intensive process? Looking at these made me recall an event I had attended at a village near Chitradurga a month back. It was a ‘simple’ marriage organized by a member of the Karnataka Raitha Sangha and along with the ceremony, the invitees were to be made aware of many current issues. I was supposed to speak about consumer protection and my previous speaker about organic farming, yoga and a variety of such desi topics! From the absolute nonsense he spoke about a variety of issues I could gather that the lobby which he represents is out to make windfalls from the promotion of a number of organic, swadesi products and also promote their agenda of Hindutwa. He spoke about how toothpaste can cause blood glucose values to shoot up as it contains sugar! It was a very serious issue for diabetics particularly those who do not know that the pea size blob of tooth paste if it were containing sugar as sweetener would not contain more than a hundred milligrams of it- that is the tooth paste used for a month would contain one teaspoon of sugar! This not withstanding the fact that no toothpaste uses sugar as a sweetening agent! They use saccharin or sorbitol or xylitol for that, the latter having another role as humefactant too! Then he spoke about how edible oils are cheap- his reason was that they are adulterated with mineral oil- called as liquid paraffin! He was not aware that a high school student level chemical test can demonstrate that and if such were to be detected, the vendor would be prosecuted under the Prevention of food adulteration act which prescribes imprisonment and heavy fines as it is a criminal offence. Likewise he went on with a number of such blatant lies. Listening to his propaganda gave me an idea of what this organic lobby is after and how they try to create market for the expensive stuff they peddle. Let us take a few examples of these- one of the main culprits pointed out by this lobby is sugar- the true one- sucrose from sugar cane- by claiming that it is prepared by using animal bone and claiming that the white sugar is harmful to health, they try to promote what is called as organic sugar and jiggery. While sucrose is not very good for the lipid profile it is a source of quick energy for those who need it- Not withstanding whatever source it may come from! While ordinary sugar ( a substitute of which can be also made from plastic- which costs not less than Rs.120 per kg as rumoured) costs Rs.40 per kilogram, the organic variety costs three times the same! The whole idea of spreading the rumors about animal charcoal, other contaminants is to promote the sale of this so called organic sugar and jaggery. How about rice then- the staple food of the orient? Well there is this new found craze for millets called as siridhanyas which are claimed to be panaceas for a number of diseases. This is what an eminent physician, Dr,Shrinivas Kakkilaya has to say about them." Siri Dhanyas or Rich grains, are nothing but millets, like Ragi, the finger millet. They have suddenly become a fad – after Yoga as a cure for all ills, now it’s the time for the Siri Dhanyas as the wonders to prevent and cure all ills. But just as Yoga is neither true yoga, nor is a prevention nor a cure for any ills, the Siri Dhanyas have no Siri, and no preventive or curative properties against any diseases. Only the selling middle men will become Srivanta or rich!All these grains are millets - pearl millet (Sajje, Bajra), Barnyard millet (oodalu in Kannada), foxtail millet (navane), Kodo millet (arka or haaraka), Proso millet (baragu), little millet (saame) etc. And like ragi, all these millets have carbohydrate content ranging from 61-70%, about 4-10% less than that of rice and wheat. The caloric content, fiber content and protein content of these millets are also comparable to those of rice, wheat and corn, with only minimal differences. Therefore, terming these millets as extraordinary, or as nutritionally superior to rice or wheat is wrong and totally misleading. (In comparison, most vegetables have carbohydrate content of 1-3%) Consumption of these millets will neither prevent any disease, particularly diabetes, nor will help in the control or treatment of any disease, including diabetes. Moreover, there is no evidence to prove that these millets can prevent or cure any illness." Besides these are quite expensive costing around 100 rupees per kilogram. To be fair these are need far less water than rice and are also drought resistant. But that is no reason to resort to rumor mongering to market them.Substituting them for rice may be good idea in the long run but there is no need for spreading lies about rice for that. That brings us to another item- the egg. There is a whole Manuvadi lobby waiting to deny nutrition to the under privileged classes. There are organizations like ISKCON who claim to supply quality midday meals to schools.They were the first one’s to lobby against the supply of eggs to school children to improve their protein status. They along with some swamis of maths opposed the move and succeeded in replacing that by a banana as if there can be any comparison between the two in terms of the content of protein. Anyway the same lobby now wants to campaign against eggs in other places too. So, videos are shown where a part of an omelette is held to a flame and it bursts into flame trying to prove that it is some plastic like material. They do not even realize that egg albumin or some other such proteins are those unique molecules which get irreversibly denatured and insoluble on heating in contrast to most others whose properties are the opposite and hence difficult to replace by a synthetic molecule. This is to scare people from consuming eggs which are at present, value for money wise are the best sources of top quality protein and acceptable to most. In fact the egg white protein, albumin has been given the biological value of 100, the yard stick against which all other proteins are measured. The whole idea is to keep people from consuming eggs by spreading stories like this! That something like an egg can burst into flame sounds like a difficult thing, it has a scientific explanation- the process of cooking denatures the proteins and also dehydrates it. Making an omelette mixes the lipid rich yolk with the white and fats as we know are combustible. There is some oil used to cook it which literally adds fuel to the fire! Coming to adulteration -the most common one is that of milk which is not campaigned against at all. There are stories of buffalo milk being diluted and color added to pass it off as cow’s milk not any cow- but the desi cow and enhance its value by more than double! The same is done with ghee with another addition- that of vegetable shortening (vanaspati) and passed off as pure desi cow ghee, honey being adulterated with acid hydolysate of sucrose etc. The vested interest behind the propaganda about plastic rice, synthetic egg, plastic sugar is this lobby who want to press their agenda of so called ‘organic’ ‘pure’ food free of fertilizers and insecticides. Examples are shown of people who are now quite aged with the caveat that they have lived for so long because of their diet and they are strong because of what they ate! People do not realize that to live upto that age being born in those good old days one had to be strong! The average life expectancy in1947 was 31 or so. Now it is more than double of that despite of all the fertilizer, insecticide saturated food, polluted air, plastic rice, synthetic egg et al. Even as far as the claims of taste go, even expert chefs have failed to indentify the ‘organic’ ‘better tasting’ fruits and vegetables when tested with blind folds! So, we should resist all attempts to thrust one’s own food habits on others by hook or crook by such rumors. Synthetic eggs, plastic rice, plastic sugar are neither practical nor economically viable. These attempts to mislead the gullible public through videos and whatsapp messages should be strongly resisted. Could not resist adding a few photographs to make my point. Here are simple tests to detect whether the egg is ‘synthetic’ or natural! Take a little bit of egg white and dissolve in 1000 times of quantity of water and mix well. Add an equal quantity of Biuret reagent- If it is natural a violet color is seen. If it is ‘synthetic’ then this color will not be observed the solution will remain blue. (I have not tested it with any synthetic egg because I could not get one so far, if any one gets one they could send it to me). To detect ‘plastic rice’ add a drop of iodine solution to the cooked rice after it comes to room temperature. It will turn dark blue/violet due to presence of starch (which is supposed to be replaced by plastic in the synthetic rice). 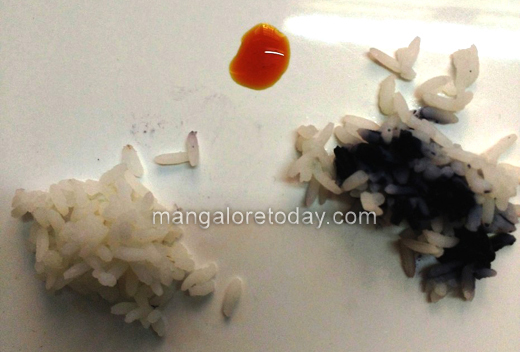 The picture shows plain cooked rice, drop of iodine solution in the middle and genuine rice! (have not tried with plastic rice but would be glad to do it if any one can supply the same). The photo of the burning piece of omelette has been made from a genuine poultry egg. Because it was claimed that only synthetic eggs would burn like that I had prepared one(ate almost all of it)took a little piece and put it in the flame!